Tightly focused EQ and optional use as a buffer make this one flexible booster. More compact boosts are available. 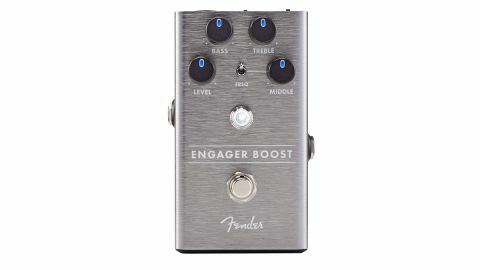 Offering up to 20dB of clean boost, the Engager Boost features three-band EQ to target that boost just where you need it. The Level knob delivers boost smoothly from its unity gain starting position through to the full 20dB, which is more than enough to tickle a clean amp’s valves into overdrive. Bring in the EQ and there are plenty of opportunities to excite certain frequencies. The Treble and Bass knobs cover pertinent ranges - the treble’s top-end enhancement being particularly tasty. Perhaps more crucial for some, though, is the Middle knob with its two frequency ranges to operate in: one throaty, the other more like an amp’s presence knob, but both offering options to project through a mix. There’s a range of switchable boosts to take things to another level or add an extra voice to a drive pedal, but there’s another role as an ‘always on’ tone builder and buffer.